The Mossslian Pre-Moistened Lens Cleaning Wipes is ultimate convenience in cleaning of all the lenses, Specially formulated with a unique, gentle alcohol solution, light scent, these wet wipes gently and effectively remove smudges, dirt and germ. Leaving optical surfaces free of scratches, streaks or residue. Individually wrapped and disposable Lens cleaning wipes brings you on the go convenience, wherever you are, whenever you need, this lens cleaning wipes can be conveniently stored in the car, at home, at school or at work. One Wipe, just clean and toss. Easy cleaning no longer have to worry about cleaning the lens. It's necessity to go out and travel. You can put it into a briefcase, pocket, cosmetic bag and wallet. It is also suitable for home, office, sports, outdoor activities, traveling, shopping, dating. ✔ MacBook laptop & touch screens. Package includes 100 individually packaged lens cleaning wipes. Warnings: On glossy surfaces, test a small area first. Single use only, please use new wipes as needed. A dirty or dry wipe can scratch. Keep out of reach of children. Not for use on contact lenses. Contains isopropyl alcohol. Avoid contact with the eyes. If contact occurs, rinse eyes thoroughly with water. Ideal portable solution for quickly and effectively cleaning all of smartphone, CD, watch, glass, lenses, mirror, screen. Individually wrapped wipe is available to carry everywhere, Anti-breakage package, Travel Friendly. Streak free and light scent: One wipe can clean a dirty lens entirely, leave ZERO streaks,residuce, marks and smudges on the lenses .Individually wrapped wipe is handy to have around,Anti-breakage package, Travel Friendly. " 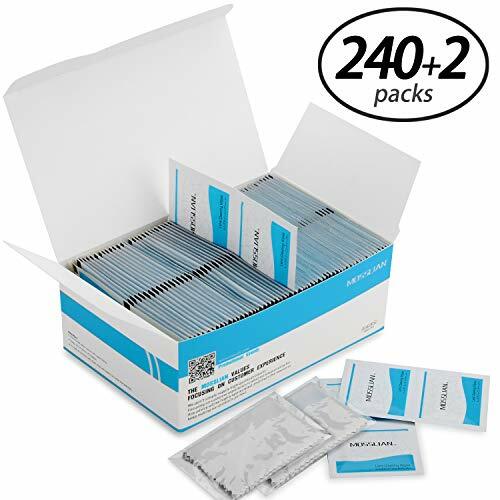 240 individually wrapped wipes is designed for anytime, anywhere one-time use,Anti-breakage package, Travel Friendly. Streak free and light scent: One wipe can clean a dirty lens entirely,Non-abrasive, antistatic micro-fine tissue cleaning wipes that leave zero scratches, streaks or marks on eyeglass lenses. If you have any questions about this product by MOSSLIAN, contact us by completing and submitting the form below. If you are looking for a specif part number, please include it with your message.